Unexpected illnesses and accidents can and do happen. It isn’t pleasant to think about, but dying without a Will makes things more complicated and stressful for loved ones at an already difficult time. Having a valid Will makes the process smoother, and provides peace of mind that your final wishes will be carried out. I don’t own a house or property that’s worth a lot of money. Do I still need to make a Will? Yes. You can still use a Will to help ensure that your prized belongings, including items of sentimental value like heirlooms and photos, go to the people who will most treasure them. This could be a friend or family member who wouldn’t usually inherit. You may also leave money or property to your favorite charitable causes. A Will is about more than “who gets what.” It is used to appoint an executor—a person you trust to make sure your wishes are carried out and your financial affairs, such as remaining bills or outstanding debts, are settled. This could be a family member, friend or a corporate fiduciary (like a bank trust department). Is all of my property covered by a Will? Not necessarily. A Will only covers property owned or titled solely in your individual name. Property that has a valid beneficiary designation, transfer-on-death designation or payable-on-death designation will go directly to the beneficiary you have specifically designated. Common types of property that have designated beneficiaries are life insurance and retirement accounts. Typically, you fill out a beneficiary designation form when you first purchase life insurance or open a retirement account. In addition, in some states, including Kansas, you also have the ability to pass financial accounts, vehicles and real estate directly to a named beneficiary by using a payable-on-death or transfer-on-death designation for such property. Property that is titled with another person as joint tenants with right of survivorship will also pass directly to the surviving joint tenant. Joint tenancy is a common form of ownership between spouses. Just as it is important to keep your Will up to date, you also need to keep these beneficiary designations up to date. If a designated beneficiary is deceased, can’t be located, or is no longer the person you want to receive that particular property, your out of date beneficiary designations can result in that property not passing as you intend. 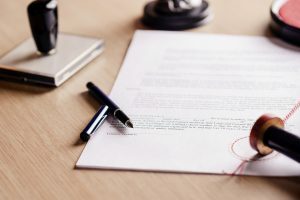 If a person dies without a valid Will, any property owned solely in such person’s individual name passes to heirs-at-law through a process called “intestate succession.” Keep in mind that property held in joint tenancy or covered by a valid beneficiary, transfer-on-death, or payable-on-death designation would still go to the named beneficiary(ies). All states have intestate succession laws, though the order in which heirs inherit varies from state to state. Under Kansas intestate succession law, property would first go to the surviving spouse and/or descendants (biological and adopted children, grandchildren). If there is no spouse or descendants, property goes to parents. If there are no surviving parents, then property goes on to descendants of the parents (siblings, nieces and nephews), then grandparents, then descendants of grandparents (aunts, uncles and cousins), and so on until there is a beneficiary. If no beneficiaries are found, the property goes by default to the state. Intestacy laws are intended to distribute property and assets in a way the average person typically would. However, this may or may not match up with what you want. For example, individuals who are not family members and charitable organizations cannot take property through intestate succession. Therefore, it is especially important to have a valid Will if you want to leave any of your property to non-family members or have charitable intent. How do I get started making a Will? In most states, including Kansas, you must be 18 to make a will, and you must be “of sound mind,” meaning you are capable of understanding your decisions. Beyond that, the legal requirements for Wills vary by state. Therefore, having an estate planning attorney draft your Will gives you the peace of mind that it will be valid and enforceable in your state. In addition to preparing Wills, Morris Laing’s estate planning attorneys can assist you with the preparation of trusts, living wills, and powers of attorney, and also provide advice on tax planning, business succession planning, and premarital agreements. Making a Will is one of the best things you can do for your loved ones. By making your wishes clear, you help them avoid unnecessary difficulties while giving yourself peace of mind. Morris Laing offers estate planning services, including Wills and trusts, at our Wichita, Kansas office. Contact our attorneys today at (316) 262-2671.